Do not worry about your future, says the LORD. For you cannot control it or dictate what will be. Why fret about what is coming, and waste this day that I have given to you! Do what you can while it is day, and KNOW that the future is in My hands. Your times and seasons are in MY hands, and there is nothing that you can do to stop what I have planned and purposed, says the LORD. I have kept you all the days of your life, and I am keeping you now, says the LORD. 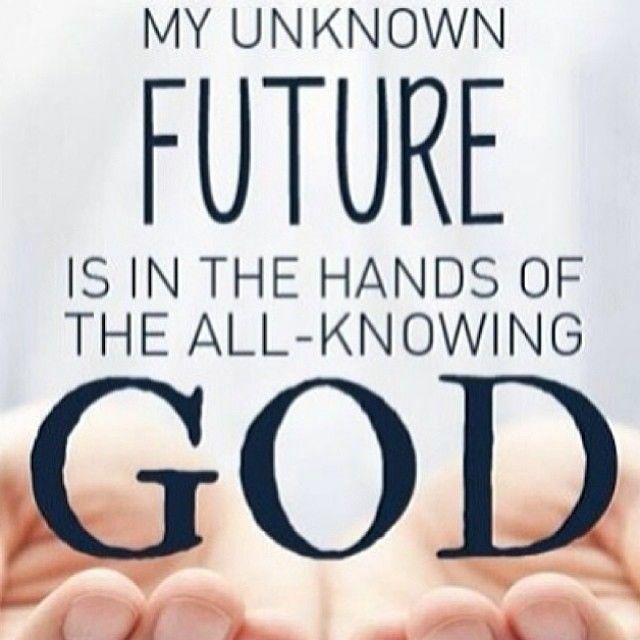 I will keep you in the unknown future, for I am FAITHFUL AND TRUE, as your Great Shepherd. You will not need to fear, for I have NOT appointed you unto wrath! You are My beloved child, and the unknown to you is KNOWN by Me. I will preserve you, protect you, provide for you. Trust that you are safe in my hands, and nothing can be more powerful in your life than I am, says the LORD. I am in your hands ! I say yes to your plans for my life! Amen I receive it! I believe it! Thank you Jesus! Thank You, Lord Jessus, for Your assurances of Your continuing LOVE & CARE and for Your freely given gift of GRACE rising from the death of Your Precious Son & my SAVIOR on the Cross and His shed BLOOD for my SINS & those of ALL BELIEVERS!!! Amen. A very comforting message.